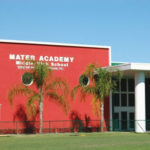 Mater Academy High School, a Miami-Dade Public Charter School located in Hialeah Gardens, Florida, has been recognized as one of our nation’s top 400 high schools. The school’s 2800 students are predominately Hispanic and many of them will be first-generation college attendees. Jorge Macho, Mater Academy’s IT Security Manager, says, “We needed an access control system that would allow us to dictate who and when someone accesses our classrooms, offices, and other sensitive areas.” Janitors are on duty 24 hours a day. With the mechanical key system they had in place, each time someone lost a key, they had to re-key their classroom doors. The work was expensive and had to be contracted out to local locksmiths. Also, keys were being duplicated at local hardware stores. “We had all the security problems schools typically experience,” says Macho. “After researching many options, we chose CyberLock because of its affordability and the security features it offered,” says Macho. “The transition to CyberLock went smoothly because the system required little effort to install,” he adds. There are at least 200 CyberLocks installed throughout the school. All they had to do was replace the cores in their existing door locks with CyberLock electronic cylinders. Mater Academy plans to expand the CyberLock system to include the new 2-story building annex when construction is completed. Mater Academy has issued 150 electronic keys to their staff and teachers. Each key contains that individual’s access permissions. Teachers’ keys are programmed to be active only during school hours. Each janitor’s key contains the access privileges they need to do their job. “CyberLock has minimized the security risks from frequent turnover in this department,” says Macho. The audit report of activity from the locks and keys helps school administrators when security issues arise, and the expenses associated with re-keying have been completely eliminated. “CyberLock has been an excellent fit for securing our school. We are extremely happy with the system,” affirms Macho. "CyberLock has been an excellent fit for securing our school. We are extremely happy with the system."